Everybody knows how entertaining a drum kit can be. Whether you’re just having a jam or sitting down to write the next ‘We Will Rock You,’ drum kits are renowned for providing families with hours and hours of enjoyment. So why not introduce your kids to this awesome hobby at a young age? Secondly, if your child enjoys playing the drums at a young age, you can encourage them to pursue drums as a skill as they grow up. As you can imagine, a full-sized drum kit is far too big for your little ones. Fortunately, some of the leading child toy companies have released a comprehensive set of drums that are perfect for your kids to use. Specially designed to be as engaging as possible, this is a great way to introduce your child to the wonderful world of drumming. To help you along the way, my list features some of the best drum sets that are currently available, giving you many options to choose from. If you’re still not sure how to choose the best drum set for your child, my complete checklist details everything you need to know about drums so you can make the right purchasing decision. Are you ready to see what the drumming world has to offer? Here are my favorite drum sets that could be ideal for your children to get creative and have some fun. To starting off my list, I’ve chosen an awesome little drum kit that comes with everything you need for your child to have the best experience possible. This set comes with three electronic drum pads and a cymbal, each with its own high-quality sound that your child will love. To help boost your child’s sensory development, you can choose from 4 different game modes which help to teach your child about letters, numbers, and music. 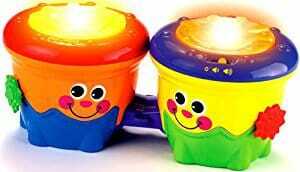 Each drum also comes with its own LED light so your child can easily pick up what they’re doing. Suitable for children between the ages of 2 and 5, this set is ideal for parents who want to enhance their child’s learning development while having fun. The set comes with two highly durable drumsticks for playing and includes a set of batteries so your child can stay playing as soon as it has been delivered. This fully-featured drum set has everything you need from a child-friendly drum set at an affordable price. What's Great About It: The leading feature of the VTech Drum Set is the ability to choose from nine melodies that your child can play along to. There are multiple styles to choose from including dance, pop and rock; and there are various learning modes. If you’re looking for a more premium high-end drum set that comes with all the features you’ll need for your child to fall in love with, this set may be for you. This is a one-drum, bongo-style set, but comes with an extensive range of accessories and toys that will keep your child entertained for years to come. Included in the set, you’ll find a collection of Caterpillar designed tambourines, two shaka-shaka eggs, a bee maraca and clacker, and jingle-bell ants, allowing your child to experiment with the music they want to create. The drum itself is made from the highest quality plastic materials and features a perfectly placed handle for easy carrying, and a breakaway strap, perfect for your child to parade around the house while showing off their musical talents. Furthermore, to produce the highest quality sounds, the set comes with two centipede-style drumsticks so your child can play away to their hearts content. With the ability to be played with both the sticks and their hands, your child has complete freedom to play any way they like. What's Great About It: As there are so many different parts to this set, there’s enough for the whole family to get involved with making it a great way to spend quality time together. You could even start a family band. The WolVol Drum Set is easily one of the leading drum sets on the market. This multi-functional, fully-featured set is designed to look and play like an adult sized drum set, except that it’s specially designed for kids. The entire set is electronic with an included volume control as not to disturb the neighbors. There are two drum pads, a cymbal, a microphone and even a bass drum with a pedal so your child can easily start to pick up how to play an adult-sized drum set, perfect for introducing them to this fantastic hobby. With this purchase, you’ll receive two drumsticks for an easier style of play, and there’s a huge variety of integrated tracks to choose from that your child can play along to. In addition to play-along melodies, your child can select full-length songs, dance music tracks and rhythmic drum beats to play along to. When your child is ready to get the party started, they can activate the built-in lights that help to set the rock ‘n roll tone. What's Great About It: In addition to the sturdy, highly durable build, you’ll also find an 8-inch stool. This is perfect for adapting to a drummer’s natural position and allows your child to sit down and enjoy this drum set to its full potential. Specially designed for younger children and toddlers, this Crawl-Along set is ideal for babies to sit and play with. 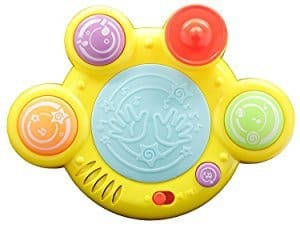 This simple yet effective and entertaining design features two visually unique electronic bongo drums that produce high-definition sounds with every touch, stimulating your baby’s mind for increased levels of development. 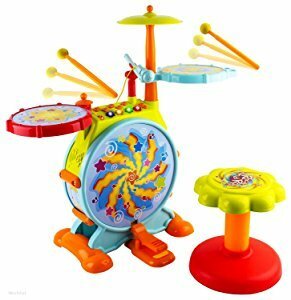 Built into this drum set, you’ll find four unique songs that will further your baby’s experience alongside two fun spinners that are vibrant and colorful. In addition to the funky sounds, each drum kit comes with its own set of lights that activate every time your child engages with the drum set. These lights have randomized settings which will flash to your child’s amusement. This visually entices your child to want to play with the toy, furthering their enjoyment and stimulating their mind. What's Great About It: The leading feature of this drum kit is its ability to convert. 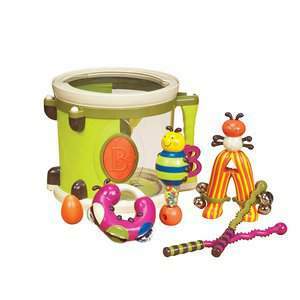 Once your baby is starting to crawl, the drum set can be transformed into a rolling bongo drum. This encourages your baby to crawl as they interact with the drum set, boosting their physical development. The Ribbit-Tat-Tat Musical Drum is a fine addition to my list of favorites. The unique drum pad design is incredibly easy to pick up and use with minimal guidance from an adult, allowing your child to learn the drums at their own speed. This drum’s integrated learning system can teach your child how to play certain beats and techniques using the built-in lights. Your child can choose between familiar and popular nursery rhyme songs while the engaging and entertaining sounds play once your child has mastered a certain technique. This drum set is sure to get all your child’s creative juices flowing. The set comes with two individual drumsticks so they can start playing straight away, while the LED lights under each pad react simultaneously to your child’s movement, creating a full experience that they’ll instantly fall in love with. Regarding safety, the entire set is produced using BPA-free materials to protect your child’s health, because we all know that the parts will end up in your child's mouth. It is designed to be as gender neutral as possible, making this one drum set that the whole family can enjoy. What's Great About It: In addition to all these outstanding features, this drum set also includes a unique recording feature. This allows your child to record their songs and play them back, so they can dance to their own creations. The entire set runs off 4 AA batteries, meaning you can take this toy with you wherever you go. If you’re looking for a lightweight, compact drum set that your child can enjoy, the Techege Toy Fun Drum could be ideal for you. The drum is designed with fun and bright colors that will engage your child, increasing their desire to use the toy, making it a worthwhile investment. Each drum set contains a unique set of colorful lights which activate when your child plays funky and head-bopping sounds. This multi-touch device means your child can interact with all the drum pads at the same time, giving them unlimited options when it comes to the beats they can play. There are multiple built-in songs included with the device that can be cycled through with the designated button, providing your child with the rhythm they need to party all day long. 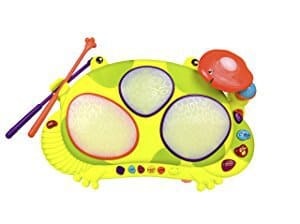 What's Great About It: Due to the diverse design of this drum pad, it’s incredibly easy to learn how to use, making it suitable for babies who are a couple of months old. It’s small, compact, and lightweight design also means you can take this entertaining toy with you wherever you go. When seeking out a new toy for your little one, some parents will be looking for the most fully-featured product that will allow their children to enjoy the experience of these drums to the fullest. This is the exact market the Rabing Kids Drum Set has mastered. Featuring three highly-interactive drum pads and two cymbals, your child is given a ton of flexibility alongside the opportunity to get really creative, all while increasing their sensory development. This drum set includes five unique playing styles with customizable sounds effects. 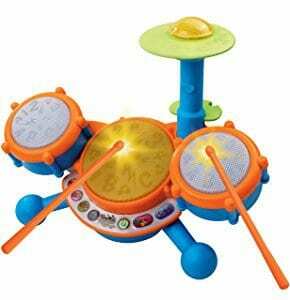 Each part of the drum set includes its own set of LED lights to visually stimulate your child as they play. You’ll be able to choose from ten gorgeously composed songs and three dynamic rhythm and drum beats which are perfect for your child to play along to, teaching them the necessary skills and techniques to truly master the drum set. There’s a handy volume control panel which allows you to set the perfect volume for your kids and for the room. This kit is designed to be as vibrant and visually pleasing to your child as possible, guaranteeing that this is a set that they will fall in love with. What's Great About It: This is one drum set that comes with everything your child could ever need. With your purchase, you’ll find two highly durable drumsticks as well as an attachable microphone that records your child’s voice. You can even connect this microphone to a computer for customization of your child’s voice. Now that you know some of the best drum sets that are available on the market, it’s time for you chose the perfect one for your child. Follow my step-by-step buying guide below to match up your personal requirements so you can make the best purchasing decision possible. Depending on the age of your child, you’re going to want to choose a suitable drum set for them. If your child is only a few months old, you’re going to want a smaller, more compact drum set. These are usually found in a ‘pad’ form, where all the interactive parts of the drum are in a single, integrated panel. 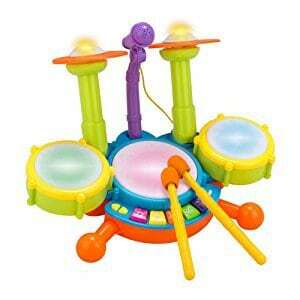 This makes for the ideal start drum set that will encourage your children into using this toy. 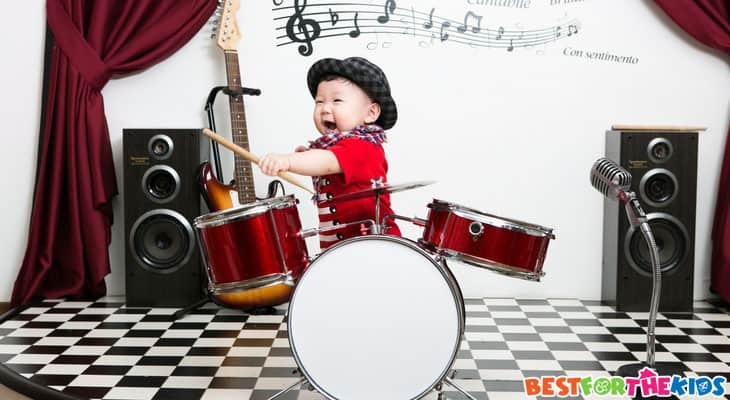 If your child is a bit older, entering the toddler stage, it then becomes suitable to get them a more functional drum set. This means the drum pads will be styled to look more like an actual drum kit with all the features, including the pads and the cymbals, and are in a similar place to where they would be on an adult-sized drum set. To make things even more realistic, you’re likely to get drumsticks with these models. Included with most of the drum sets, you will find a complete range of other built-in components that maximize your child’s experience. This can include integrated songs, melodies, and beats that your child can learn to play along to. On some of the more high-end models, you’ll receive a whole range of different song modes, and your chosen drum set may even include different beats which can include rock, pop, dance and classical. If you’re serious about encouraging your child into the world of drumming, these drum sets are ideal as they can effectively learn the correct techniques for playing which can be easily transferred to a full-size drum set when they are old enough. As with all children’s toys, you’re going to want a toy that is easy to learn to play. Great features to look out for include large drum pads, easily identifiable buttons, and large controls. This will maximize the efficiency in which your child can learn to play the drum set which will further maximize their enjoyment of the product. As you know, drums are made to be hit. With this in mind, you’re going to want a drum set that is highly durable. This won’t be a problem with the drum sets on my list as they are all produced using high-quality materials. But remember, the cheaper you buy, and the cheaper the materials, the more likely the low-end toys are to break. If you’re shopping for a drum set in a physical store, it’s easy to tell how durable the set is just by looking at it and feeling the toy with your hands. However, if you’re shopping online, always look to see what materials the drum sets are made out of and which quality control measures the drum has been approved by. Some other key features to look out for when choosing the perfect drum for your child are lights and interactive sounds. It’s highly recommended that you choose a drum set that has lights that flash when you child interacts with it. This is extremely stimulating to your child’s mind and has been proven to help increase their mental development. I completely understand that buying a drum kit may seem like the worst thing you could buy for a child. Images of your child banging away at all hours of the day will instantly spring to mind and is not what most parents would consciously choose. However, most of the electronic drum sets included in my favorite's lists include a handy volume control option which means your child can still enjoy the drum set, even if they are around the rest of your family. How your drum set is powered is a very important aspect to consider. The majority of children’s drum sets will be battery-powered, like all the sets on my list. This gives your child the freedom to play whenever and wherever they like. Try to avoid the mains powered ones as they are known for being very restrictive. If you’re looking for ways to boost your child’s mental and physical development while introducing them to an extremely beneficial talent and hobby that could last a lifetime, an electronic child’s drum set is the way forward. Relatively inexpensive, these toys are ideal for children who are budding musicians and are the perfect way to spend some time together as a family. More Musical Toys & Gear!